I am a firm believer in feeding the girls a warm breakfast every morning. Our typical breakfast rotation features Spelt Pancakes, Scrambled Eggs, and Oatmeal. The only problem with oatmeal is that it takes about 10 minutes to prepare on the stove top and another 10 minutes to be cool enough for the girls to eat. I was using a few ice cubes to cool off the oatmeal but that left the oats a little too runny for Claire to feed to herself (and not make a total mess)! 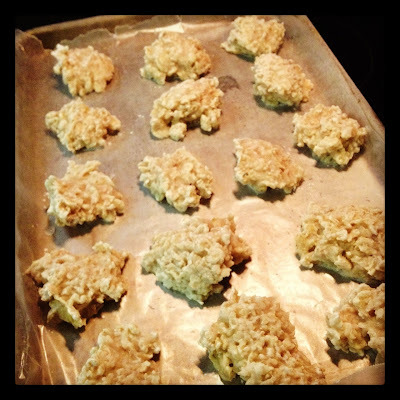 In an effort to get thick oatmeal into the girls bellies a bit faster I came up with these Oat-sicles! 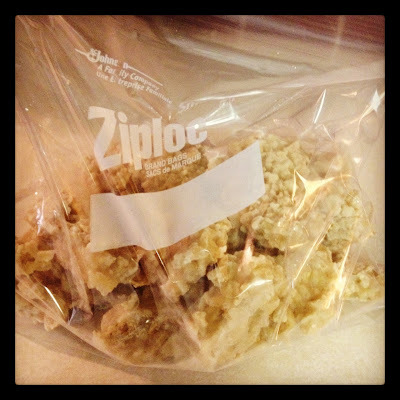 I made an extra big batch of oatmeal one morning and then placed spoonfuls of the oatmeal onto a cookie sheet lined with wax paper and placed it in the freezer for a few hours and then transferred the oat-sicles into a ziploc bag to keep in the freezer! Now I just place an oat-sicle or two in the girls bowls and pour the hot oats over the top! Perfect temperature oats in no time!! Claire eats her oatmeal plain but Kenley and I love it with a spoonful of nut butter and a drizzle of maple syrup! Enjoy! I love experimenting with oats! Oats is my favorite breakfast! I just mix water in it. No added sugar or mix. I just mix the oats with water, a sprinkle of pink salt, and a drizzle of vanilla extract! Topped with but butter and maple syrup it is so delicious! But butter? Ha add in some ground flaxseed meal and you can get most of your fiber for the day!